M. haemolytica is responsible for causing contagious bovine pleuropneumonia, a bacterial disease which causes pneumonia and inflammation of the lung membranes. It is a Gram-negative coccobacillus (elongated, rod spheres) which shows mild haemolysis when plated on blood agar plates. This species comprises of 12 capsular serotypes (of which some are more responsible for disease than others). Serotype A2 is associated with sheep pneumonia. Typically, diseases associated with M. haemolytica present themselves as fever, along with nasal discharge, coughing, inappetance and weight loss. Death associated with this bacteria is typically due to acute fibrous pleuropneumonia. Pathological observations would reveal an obstruction of the bronchioles with a fibrous exudate and an accumulation of neutrophils and fibrin in the alveoli. There will also be thrombosis and distension of the lymphatic vessels. M. haemolytica resides in the nasopharynx and tonsils of healthy cattle. A balance between the host and bacteria, under good environmental conditions maintains homeostasis between the host and bacteria (i.e. no disease). Should environmental conditions alter however, the balance may be tipped in favour of the bacteria, removing the status of homeostasis and resulting in disease. Key inciting events for disease include; weaning, adverse weather conditions, dehorning, feed changes and transportation i.e. causing stress. Stress provokes the bacteria in the nasal/tonsillar mucosa allowing them to be inhaled in to the lungs. In healthy cattle clearance of the bacteria from the lungs is efficient enough to prevent disease. This suggests that stress induced alterations in immune functions can lead to host susceptibility and thus development of disease. Close contact with other animals increases exposure to microorganisms which upsets the natural balance of commensal bacteria within the host. Changes in the natural microflora can cause M. haemolytica to revert to a pathogenic state. Slight changes in the environment are responsible for creating a favourable situation for M. haemolytica to colonies the lung and thus cause disease. Leukotoxin (LKT) is an actively secreted exotoxin which targets leukocytes, primarily neutrophils. The toxin is encoded for by four genes (lkt A-D) which can be found in the RTX toxin operon. 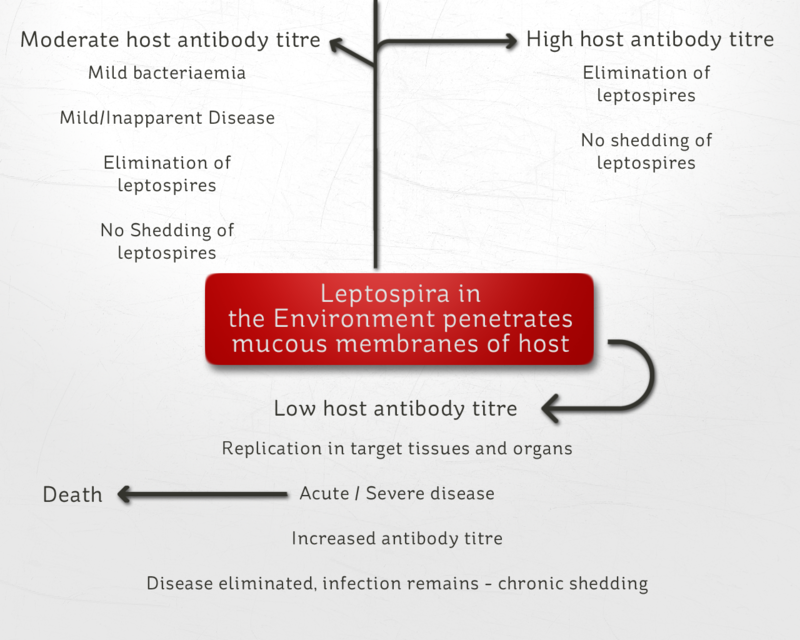 LKT help bacteria survive by allowing them to evade phagocytes. It is a type 2 exotoxin (membrane-damaging) which binds to leukocytes via the cell surface receptor CD18 (an integrin). It forms pores in the cell membrane of leukocytes which leads to an influx of K+/Ca2+ ions. This promotes swelling of the leukocyte and ultimately lysis of the cell. Neutrophils affected by the toxin also become overly active, they overproduce certain mediators, reactive oxygen species and proteases, all of which promote further cellular and tissue damage within the host. Lesions develop which are filled with fibrous exudate and thrombosis of lymphatic vessels occurs. The alveolar epithelium also becomes damaged which is believed to be associated with neutrophil infiltration. 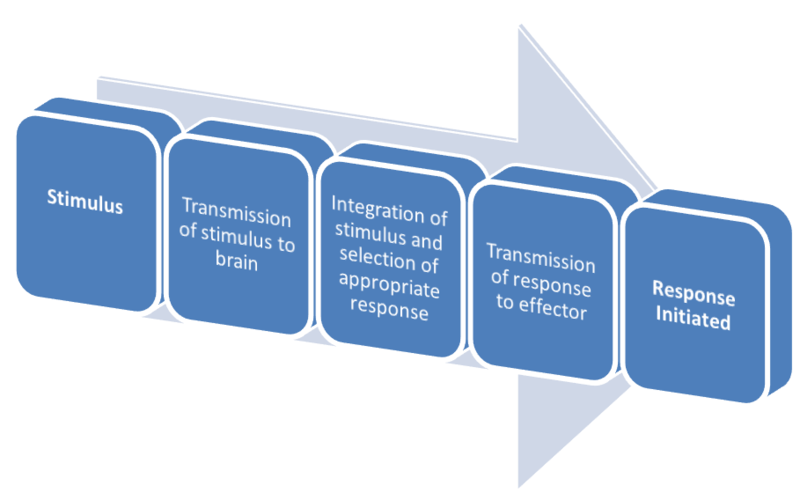 These control methods could help to restore balance to the situation (previously unbalanced by negative environmental factors). Thus homeostasis between host and bacteria would be restored and disease prevented. Bordetella bronchiseptica is an evolutionary progenitor of B. pertussis and is one of the organisms responsible for causing kennel cough in dogs. Kennel cough is the term used to describe a disease which causes coughing in a dog due to inflammation of the trachea and lower airways. Although kennel cough is primarily caused by infection of the airways with B. bronchiseptica it can also be caused by viruses such as canine parainfluenza. Clinical signs of kennel cough include; an intense cough, mucus, nasal discharge and breathing difficulties. Kennel cough gets its name from the frequency of infections which arise in dogs temporarily kenneled for example whilst the owner is on holiday. A number of dogs can carry the infection and the close contact in the kennels promotes transfer of the infection. Infection is caused either airborne transmission or via direct contact and has an incubation period of 3-10 days. Infected dogs can carry and shed the infection for up to four months after recovering from the disease. Because it require a only a few B. bronchiseptica bacteria to establish and infection in the airways (i.e. low infectious dose), B. bronchiseptica are considered highly infectious. Fimbriae – Associated with the initial adherence of the bacteria to epithelia. This form of adhesin allows the bacteria to latch on to host cells and begin to proliferate and form infectious colonies. Filamentous Haemagglutinin Adhesin (FHA) – A large, filamentous protein which serves as a dominant attachment factor for adherence to host colliery epithelia cells of the respiratory tract. It is associated with biofilm formation and possesses at least four binding domains which can bind to different cell receptors on the epithelial cell surface. Pertactin – An ‘autotransporter protein’ capable of getting to the cell surface without the need of accessory proteins. Pertactin also acts as an adhesin. Not all these virulence factors are active at the same time however, only some are active depending on the temperature. At 37˚C all are active except the flagellum, at at 27˚C none are active except the flagellum. What this shows is that there is a global regulation of gene expression depending on the requirements of the bacteria’s survival. For example, when B. bronchiseptica is required to colonise the respiratory tract (indicated by a 37˚C temperature i.e. body temperature) it is not going to need to use its flagella for movement so the genes encoding for flagella motion are not expressed. In contrast when B. bronchiseptica is outside of its target destination e.g. the nasal passageway (indicated by a lower temperature) the flagella genes are expressed again as movement will be required to reach the target destination (the airways). Genes encoding for virulence factors will not be expressed as there is no need when the bacterium is not at its target site of pathogenesis. M. haemolytica and B. bronchiseptica are two important veterinary pathogens as they both inhabit the same ‘niche’. This is interesting because they also share similar virulence factors. Both diseases result directly from the disruption of the respiratory epithelium and from immunopathology and both diseases are often polymicrobial, involving mutliple agents. Diagnosis relies on isolation and cultivation of bacteria on agar plates after which the correct antibiotic treatment can be given. Vaccinations are available for both diseases. These diseases show how the management of animals can influence disease epidemiology. A simple and rapid method of quantifying the amount of virus in a sample. Haemagglutination is the agglutination of red blood cells. 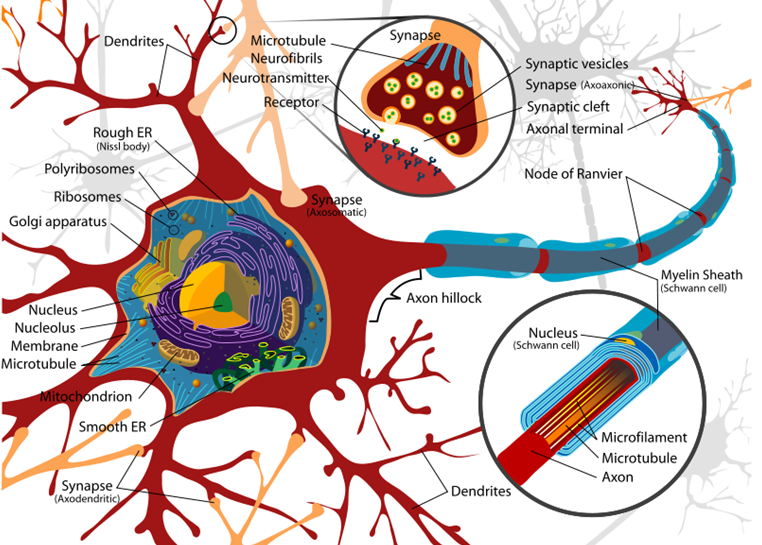 Viruses with envelops or surface proteins are able to bind to the sialic acid, N-Acetylneuraminic acid found in the cell membrane of red blood cells. Because each agglutinating molecule (in this case each viral molecule) can bind to multiple red blood cells, a clump of cells begins to form, this is agglutination. This agglutination forms a lattice structure. Haemagglutination inhibition is the addition of an inhibitor of the virus. Antisera (a blood serum which contains antibodies) is used in this case. The antibodies will bind to the virus and thus prevent haemagglutination. By creating multiple, increasing levels of dilution e.g. 1:2, 1:4, 1:8, etc. of virus to antiserum we can determine a haemagglutination titre, this is the highest value of dilution (i.e. smallest amount of virus) which inhibits agglutination. You can see that point of agglutination, where the contents of the well go from a homogenous cloudy red, to containing a red spot which is the agglutinated red blood cells. In the above example, sample E (the highlighted row) has a haemagglutination titre of 1:512 as this is the largest dilution which prevents haemagglutination. From this would we be able to see initially the virus count is low as it is inhibited at a low dilution, however at the next assay the haemagglutination titre is higher (greater dilution of virus reached before it is inhibited) this must mean the virus is replicating as the initial count of virus is higher (i.e. takes greater amount of dilution to reach inhibition). WIth the final assay, we can see that because the haemagglutination titre has decreased, the virus must be reducing in numbers, indicating recovery. ELISA is an acronym for Enzyme-linked immunosorbent assay and is used to detect whether or not a certain antibody or antigen is present in a sample. To indicate the presence of an antibody or antigen, reporter molecules are used which are identifiable by a change in colour. Therefore, if an antigen or antibody is present, a colour change will be observed. 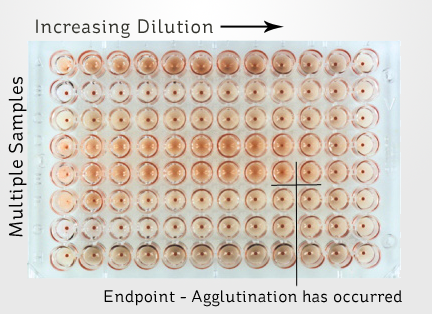 A typical ELISA requires the use of a 96-well microtitre plate (as used in the haemagglutination assay), but the wells of the plate are coated with a known or unknown antigen. When diagnosing viruses, the antigen will be unknown as it is the sample which we are testing. To this an antiserum is added, if the virus antigen is present in the sample, then the antibodies will bind. If not, no binding will occur. To determine whether or not an antibody-antigen complex has formed (i.e. a positive diagnosis of the virus), an antiglobulin is added. This is an antibody which binds to the antibodies used in the initial serum. For example, Goat anti-rabbit IgG is a rabbit antibody (Immunoglobulin G [IgG]) which will bind to goat antibodies. There are many possible variations of antiglobulins. The antiglobulin will be ‘labelled’ with an enzyme (an enzyme is attached to the antibody which has a negligible effect on its binding capabilities). Finally, the substrate of the enzyme using to label the antibody is added. This substrate will be broken down if the secondary antibody (antiglobulin) bound to the primary antibody. The break down of the substrate will be coupled with a colour change, for easy identification that this has occurred. The greater the intensity of the colour change, the higher the concentration of the initial antigen. Sometimes a spectrophotometer (a device used to detect light intensity) will be used to determine the degree of change in colour, as this can be used to calculate reasonably accurate values for initial antigen concentration and thus virus concentration in the host. This type of ELISA is known as an indirect ELISA test, however there are other forms of this test, such as sandwich ELISA, which is where the well is coated in antibody, to which an antigen binds and to this another antibody is added. The antiglobulin tests for the secondary antibody. There are also competition ELISA tests, where the added sample is an antibody-antigen complex, this is added to antigen coated wells. If the concentration of initial antigen in the sample is high then there will be fewer available antibodies to bind with the antigen in the wells. 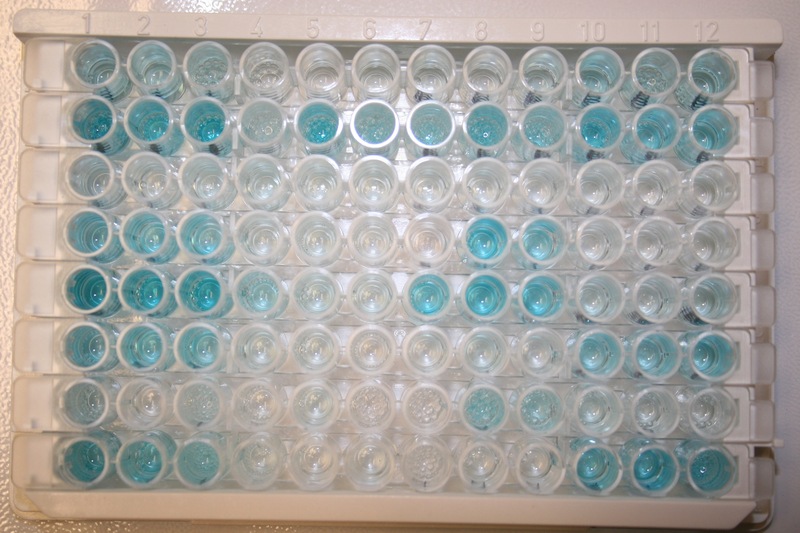 The wells are washed to remove unbound antibodies and as with the indirect assay, enzyme-coupled antiglobulins are added with substrate that elicit a colour change. However in this case a high initial concentration of antigen in the sample will yield a low change in colour.